May you and your family be nurtured with lots of love, my friend. May peace, happiness and goodwill be with you not only on Christmas time, but throughout the coming year and beyond. Sending you a special Christmas messages from the bottom of my heart – may all your wishes, dreams and desires come true! May this Christmas turn out better than you ever expected. I send you my love and best wishes, to you and your family! My friend, may all the wonderful magic of Christmas conspire to bring bliss to your heart and fill every desire you have. Wishing all my family members peace and love this beautiful holiday season. May you always feel the joy in your home that you often bring to me. Love, joy and peace symbolize a wonderful Christmas. I hope you find them all this holiday season. Have a Merry Christmas and a Happy New year! My dear friend, I wish you all the blessings of a truly happy Christmas time and I hope you feel the blessed joy this holiday season has to offer. A silent night with a star above and a sweet gift of hope and love – please receive these heartfelt wishes. A blessed Christmas to you! 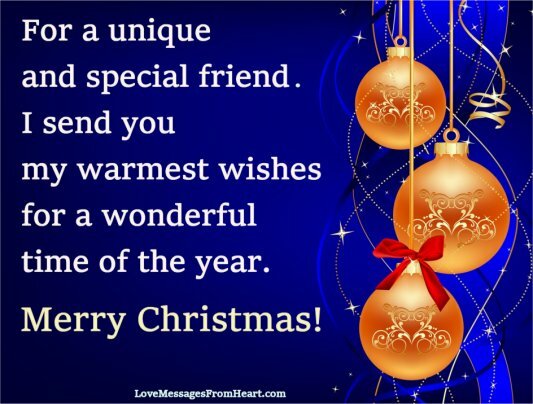 As Christmas and the New Year approaches, I want to take the opportunity to tell you how honored and blessed I feel to have you as a friend. I wish you a very Merry Christmas and an amazing New Year. May your heart and home be filled with all of the joys this festive season brings. Merry Christmas and a wonderful New Year, my dear friend! I wish you and your family all the happiness and joy of Christmas. I hope we can get together this holiday season and spend some memorable time together. I am really thankful for having a precious friend like you. Wishing you blessings for the holidays and the coming year. I know we are always busy during the holiday season, but I want to take the time to wish you and yours, happy holidays. I also hope that we will spend time together soon. For a unique and special friend. I send you my warmest wishes for a wonderful time of the year. Merry Christmas! The tree is decorated, the cookies are made, the gifts are wrapped … now all that is left is wishing you a Merry Christmas. So, Merry Christmas, my dear friend! Merry Christmas to you as well, dear visitors to this page! What. Wonderful messages. Merry Christmas!